Dawn broke fine on that fatal day. A couple of thousand feet above the tiny canvas tent the summit of the world's highest mountain stood impassively, waiting for someone to have the courage to approach. Inside the ice-crusted shelter, two forms lay still as death. Then there was a groan, a stirring, and eventually the slow scratch of match against sandpaper. Low voices shared the high-altitude agonies of waking, the heating of water, the struggle with frozen boots. As the sun rose through wisps of cloud beyond the Tibetan hills to the east, one of the men emerged through the tent flaps. It was a fine morning for the attempt, with only a few clouds in the sky. The two of them stood for a while, shuffling their feet and blowing into their hands. Inside the tent lay a mess of sleeping bags and food. The men lifted oxygen sets onto their backs, then they turned towards the mountain and stamped off into history. On the 6th June, 1924, George Mallory and Sandy Irvine disappeared into the mists of history. George Mallory's body was discovered high on Everest in 1999. Sandy Irvine's body is still believed to be on the mountain having been rediscovered in 1975 by a Chinese climber who was killed the very next day. In 1993, Graham Hoyland became the 15th English man to climb Everest having become obsessed by the mountain and the myth of what happened to Mallory and Irvine. It was his evidence that led to the discovery of Mallory's body and it will be his evidence that will lead to the discovery of Sandy Irvine's. The Last Hours on Everest is the most detailed reconstruction of what happened after the two English climbing legends left the camp on that fateful day. 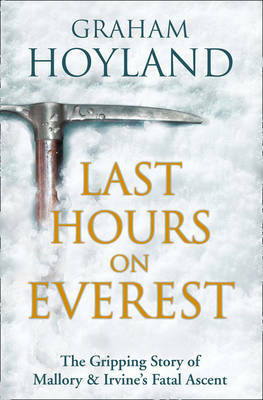 Combining personal experience, the physical evidence found on the mountain and an insight into the hearts and minds of the two climbers, Graham Hoyland produces the most compelling description of what actually happened on that day and the answer to that most intriguing of questions - did they actually climb Everest?